Holistic Select Adult Health Chicken Meal & Brown Rice Recipe is a low-priced dog food with exceptional quality. This product has no controversial ingredients, which includes no artificial colors, preservatives or flavors. However, the food has a high amount of carbs when compared to the protein and fat content. The meat and fat quality is excellent, though. IAMS has an above-average number of dog food recalls but was overall quite transparent when answering our food quality questions. In summary, Watchdog Labs highly recommends this dog food. Chicken Meal, Brown Rice, Rice, Oatmeal, Chicken Fat (preserved with Mixed Tocopherols), Oats, Pork Meal, Dried Plain Beet Pulp, Flaxseed, Pumpkin, Cranberries , Apples, Brewers Dried Yeast, Salmon Oil, Potassium Chloride, Papayas, Choline Chloride, Blueberries, Pomegranates, Vitamin E Supplement, Inulin, Dried Kelp, Zinc Proteinate, Mixed Tocopherols added to preserve freshness, Zinc Sulfate, Niacin, Ferrous Sulfate, Iron Proteinate, Vitamin A Supplement, Yucca Schidigera Extract, Glucosamine Hydrochloride, Ascorbic Acid (Vitamin C), Ground Cinnamon, Ground Fennel, Ground Peppermint, Copper sulfate, Thiamine Mononitrate, Copper Proteinate, Manganese Proteinate, Manganese Sulfate, d-Calcium Pantothenate, Sodium Selenite, Dried Enterococcus faecium Fermentation Product, Pyridoxine Hydrochloride , Riboflavin, Vitamin D3 Supplement, Biotin, Dried Lactobacillus bulgaricus Fermentation Product, Dried Enterococcus thermophilus Fermentation Product, Calcium Iodate, Vitamin B12 Supplement, Folic Acid, Dried Bacillus licheniformis Fermentation Product, Dried Bacillus subtilis Fermentation Product, Dried Aspergillus oryzae Fermentation Product, Dried Trichoderma reesei Fermentation Product, Dried Rhizopus oryzae Fermentation Product, Dried Lactobacillus acidophilus Fermentation Product, Dried Lactobacillus casei Fermentation Product, Rosemary Extract, Green Tea Extract, Spearmint Extract. This food has no controversial ingredients. This product is made in the United States, which helps ensures a high level of food quality standards. Chicken Meal, Chicken Fat (preserved with Mixed Tocopherols), Pork Meal, and Salmon Oil. The meat and fat ingredients in this product are clearly named, showing the animals they are sourced from. And to round it off, this food also doesn’t use any artificial flavors. Well done! 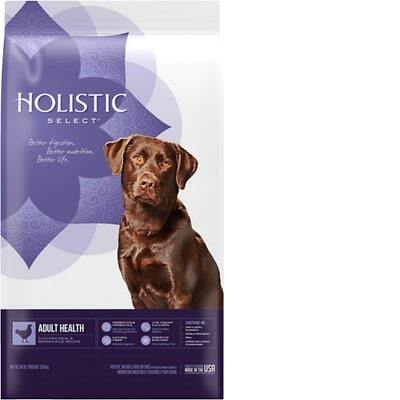 Holistic Select has a below-average number of dog food recalls compared to other brands we evaluated. Holistic Select is part of the Berwind Corp, (WellPet) which includes the brand Wellness. An email to Wellness was responded to in only 2 days. An additional email was received that suggested the responses to the Wellness email should be applied to all Wellpet Brands. There was a round of follow up emails to clarify some of the questions which were also responded to quickly and completely. It’s very much worth noting that the email contact form for Holistic Select was broken, and there was no phone number to reach them. If it had not been for the email sent to Wellness it's not likely we would have any responses for this company.